I get much joy from flowers! To me flowers are as necessary as food. My life would be bereft without them. I have enjoyed your pictures of flowers in this and other posts. Please keep sharing your flowers with us! Christie, I love flowers, and I love cakes, and I love your writing!! Don’t let the order mislead you about my preference. I likely should have listed your book first. It never was on my night-stand, but my kitchen table, where I do my best reading in the morning over tea. Your book is breathtaking! I’ve had it for awhile, without yet the opportunity to read it. Finally, I was able to indulge. But reading is too pedestrian a word to describe how I engaged with it; your book needs to be sipped and savored and saluted. So I do that now–salute you as its curator. God wrote it through you, and you were faithful to its message. Birthin’ books ain’t for sissies. It’s hard work. But oh the beautiful fruit you’ve borne. You didn’t mention fruit in your abundance list, but I note it on the cover of the cookbook you’ve recommended. Well, on second thought, you did mention banana cake. When I was a child, I always requested banana pudding for my birthday “cake.” It was my grandmother’s specialty. What was more special is that she made it just for me . . . yes, a banana-pudding ministry of extravagance and love. And flowers? Oh, flowers. How I wish I could see yours and imbibe their scents. Alas, I’ve no green thumb. Fortunately, my husband takes green bills and lavishes me with roses he gets cheaply at SAMS. Amazingly, there is nothing cheap about them. They come in a wrapper enclosing eighteen blooms and lots of love by my husband. They often accompany books on our kitchen table. I love the photo of your home-baked, flower-topped cake. Many moons ago, fresh flowers adorned the tiers of our wedding cake. In those days, this was a first. We’d never seen it done before. But what a lovely sight it was . . . . flowers in bouquets and flowers on a cake. I’ve never forgotten that sight. Thank you for all you do hear to share the lavish love of Christ. The books all look wonderful! I love beautiful books and beautiful pictures. I have loved to bake since I was young and cakes draw me in every time! I can’t make the gorgeous cakes that many bakers co, but I still love to try my hand at it and accept them, imperfections and all. I currently am reading an e-version of Shauna Niequist’s Bittersweet and a hard copy of her Present over Perfect is waiting for me. I’m also reading A Million Little Ways by Emily P. Freeman and I started The Wind in the Willows. AND, I’m still reading The Life-Giving Home by Sally and Sarah Clarkson and I love it so much! Such wonderful, warm words about home. I love your pictures of all your beautiful flowers. Kansas isn’t the best place to grow flowers, but I have some hardy rosebushes and a hydrangea that I planted last year and it has brought me so many smiles. I always buy a few annuals and have pots that need watered every day before the Kansas heat catches them! I would have a bouquet of fresh flowers around all the time if I could! The cookbook looks delightful. I saw it somewhere before and was interested in it but haven’t gotten to hold a copy in my hands yet. I love “Brown Eggs and Jam” and I think you would too. I keep checking it out from the library so much I need to buy my own copy. I’m also finishing up The Life-Giving Home by Sally and Sarah Clarkson. It is just inspirational to me in providing a warm, creative, inspiring home for my children, family, and guests. I never feel like Sally is prescriptive in what she shares. No, “you should do this or that” but just gives a treasure trove of ideas to inspire our own traditions. It too is set up seasonally. It’s more like what’s spread out on my dining room table. Listening to your Life- Frederick B.
I enjoy reading about your gardening. I love Honey and Jam. I enjoyed her blog but she hasn’t written much since her mother died suddenly just before her cookbook came out. I follow her on Instagram and she is doing much better. Her book has the best recipes, I recently made the cranberry orange cake and guilded the lily with a glaze made with confectioners sugar and orange juice. Everyone loved it. Oh, reading a wonderful book to review called Victuals by Ronnie Lundy. It is about Appalachian cooking. Christie, thank you for these wise words, this reminder of the extravagant love of God for us. If I had even the teensiest of a pale green thumb, I too would plant the practical, the useful, forgoing the beautiful as simply too extravagant. But the Bible reminds us of nothing if not that God longs to feast with us at His banqueting table and lavish His beautiful grace on us. I think I’ll celebrate this truth with a piece of cake…and maybe a vase of flowers! I’m listening to Elizabeth Strout’s “My Name is Lucy Barton” and slowly working my way through Dana Gioia’s “99 Poems New & Selected.” No rush, savoring! I always love your Farmhouse Bookshelf posts. I’m definitely getting the Mayfield book since I help teach English to refugees and know it will resonate. Thanks for another great recommendation. on my nightstand: Roots and Sky, reading the 2nd time this summer, 1st was for the book club. It led me to The Homemade Year and somehow got me to Keeping House the Litany of Everyday Life. Also there is Mornings and Evenings with Spurgeon. My Mama always planted marigolds, zinnias and four o’clocks in her vegetable garden as well as nasturtiums among the cucumbers. I plant marigolds. I wanted chickens for years and God gave me them through my son-in-law a couple years ago. Now I have eggs to give away. I think giving them away blesses me as much or more than those receiving them. My house is small and unfinished. My chicken coop is a rough shed re-purposed for chickens but I am rich with eggs to give away. 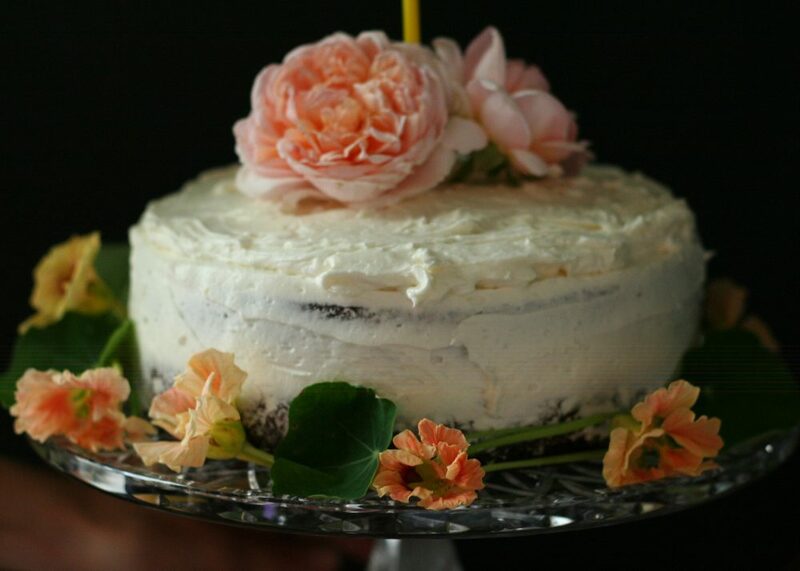 Love the idea of a ministry of flowers, and cake! I agree there is definitely a place for beauty and delight even amidst the sorrow and pain. The garden is such a wonderful metaphor for life. Beside my bedside just now are three books: a collection of poetry by R.S.Thomas, Natalie Goldberg’s Writing Down the Bones, and I’m just at the end of Frances Mayes’ Under the Tuscan Sun…which is such a feast of colour and beauty and food!